Chevrolet isn’t the only automaker having trouble keeping its secret super engine plans hidden behind its facility firewalls because prior to the Corvette C8’s LT7 being leaked to the Internet, a diagram of a V8 from Ford made a splash on Mustang6G forums and started the rumor mills spinning again. At first, it appeared as if the engine was the same 5.2-liter V8 Voodoo interned within the GT350, but the presence of a supercharger threw that theory to the wind. The lag-free forced-induction engine topper pretty much confirmed that this is the V8 that’s supposed to live in the GT500 that we all know is coming. The Truth About Cars went ahead and investigated the matter further only to find more interesting bits of news about the engine. Rumor has it that the supercharger will be a 2.6-liter Roots-style purveyor of chaos capable of Hellcat-like levels of power—think somewhere in the neighborhood of 750 horsepower. If the fact that Chevy used it to send the Camaro ZL1’s 650 horsepower to the rear wheels wasn’t enough to convince you that Ford will use the 10-speed automatic it co-developed with GM in the GT500, then maybe the flexplate in the diagram will do the trick. TTAC went a step further than looking the engine, however, and peaked at the Ford service portal where it found the Blue Oval is serious about making the GT500 a revolutionary car for the Mustang nameplate. Expect top speed to be in excess of 200 mph according to the speedometer, and if drivers with more balls than skill find themselves at these speeds without the talent to handle it, gargantuan carbon ceramic brakes will be there to turn the situation from “impending conundrum” to “thankfully we’re still alive.” To ensure that the GT500 is no Hellcat, meaning that it’ll hustle in the corners as well as it does on the drag strip, Ford is installing some sort of damper control, probably a tuned version of the GT350's Magnetic Ride Control. In addition to that there will be various drive modes including Normal, Sport, Drag Strip, Launch Control, and Weather. Like the Camaro ZL1, the Mustang GT500 should retain its manual transmission in part because not doing so would be sacrilege and also because if it didn’t, there’d be no reason for Ford to include a Heads-Up display that features shift lights among other toys. Unfortunately, there’s one big caveat to the GT500s rebirth. 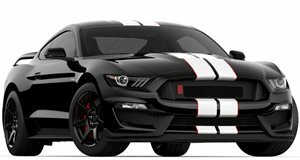 That’s the fact that a VIN lookup proves that the Mustang will still feature only three engines across the lineup when the GT500 is out, meaning that the GT350’s Voodoo will be going away so that the 5.0-liter Coyote V8 and the 2.3-liter EcoBoost remain as options for the more sane. Given the fact that so much information about the Mustang GT500 is already leaking out, there’s substantial evidence that it could hit the stage during the 2018 Detroit auto show that’s just a few weeks away. Hear that? That’s the Camaro ZL1 1LE shaking in its Goodyear boots.